If there are any ineffable facts, then it is striking that they essentially are nowhere to be found. It is natural to think of ineffable facts as rare, radical exceptions, something unusual, maybe something tied to consciousness, or art, or paradoxes. But why would that be justified? There might be lots of ineffable fact, and they might be all around us. The natural motivation for why we should think that there are any ineffable facts would seem to support this more ubiquitous conception of them. The squirrel is surrounded by facts ineffable for it. It even might live on the window sill of the Athens unemployment office, but the fact that there is an economic crisis in Greece is beyond what it can represent. It would be deeply ignorant of facts pertaining to where it lives and what is going on right around it. And similarly, we might be in the middle of something that we are deeply ignorant of and which is beyond what we can represent. But if so, this somehow doesn’t seem to come up much, or matter. The integers are spread out among the rational numbers, with infinitely many rational numbers between any two integers. But these other rational numbers would be completely hidden from the integers. With their language and thoughts they can never reach them. If they could only talk about one more number, for example 1/2, then they could reach more, but still not everything. If they only had one more concept — division — then they could reach everything. But the integers don’t have division or a name for 1/2, and so they will think that all there is to the world is what they can talk about: the integers under addition, subtraction and multiplication. The reason why the rest of the world is so systematically hidden from the integers is that the integers with addition, subtraction and multiplication form a sub-structure, or sub-algebra, of the rational numbers with those operation as well as division. Adding, subtracting or multiplying two integers always leads back to an integer, and so the integers are closed under these operations. Even though the integers are surrounded by other rational number, which get arbitrarily close to them, the integers are completely unaware of how rich the world is that they live in. All this extra structure and further glory of the world is completely and systematically hidden from them. I would like to suggest that this might in essence be our situation. We might be like the integers, surrounded by facts that go beyond what we can think or say, while at the same time it seems to us that we can represent all there is to represent, and that all of our ignorance is just ordinary ignorance, but never deep ignorance. The facts we can represent might form a sub-algebra of all the facts that obtain, and it might just be a small one. The sub-algebra hypothesis would, in outline, make sense of that, on the one hand, we are limited in what we can represent about the world, while, on the other hand, ineffable facts seem to be completely hidden and irrelevant for inquiry and other activities. Our sub-algebra might be closed under causal and explanatory relationships, which is to say that if we can represent an event then we can also represent its cause, and if we can represent a fact then we can also represent its explanation. In ordinary inquiry, where we ask for causes and explanations, we will thus never have to go beyond our sub-algebra. But when we try to understand the world as a whole, then our representational limitation might well mislead us into thinking that the part of reality we can represent is all there is to reality. Just as the integers might think that all there is to reality are the integers, so we might think that all of reality is just the part we can represent. Reality might be much richer than what we can represent about it, but the rest of it would be completely hidden from us, and irrelevant for our ordinary and even regular scientific concerns. Except, of course, for the question what reality as a whole is like. For that question and its consequences our deep ignorance will matter. Featured image: Squirrel on a fence by milito10. Public domain via Pixabay. 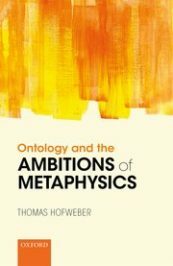 Thomas Hofweber is professor of philosophy at the University of North Carolina at Chapel Hill. His research specializes in metaphysics and the philosophy of language. He studied for his undergraduate degree at the University of Munich, before completing his PhD at Stanford University. Before moving to North Carolina, he taught at the University of Michigan, Ann Arbor. There are qualities of which we are acutely aware but which are inexplicable in scientific terms. Such are feeling pain and the perception of particular colors. Seems kind of silly. If the intergers can multiply they can figure out division and hence ‘invent’ rational fractions. Does the simple fact that we can give a name to something, thereby give a representation to it so that it becomes an effable fact? We conceptualize something we call the “universe” and thus it becomes an effable fact, represented by the label “universe”. Since representable facts have causes, if we say that God was the cause of the universe, God becomes a fact because it satisfies the criterion of effability as the representation of the cause of the universe. Was “dark matter” not a fact (i.e., had no existence) because we had not discovered it? Or is it not a fact because we don’t know what it is or how to find it? Did it come into existence because we labeled it? Is teleportation therefore a fact because it is effable? Or is truth a fact because it can be represented? Rudy – We ought to distinguish the inability to represent something from the inability to refer to something. Just as it is possible to represent something while referring to nothing (‘purple cow’), and it is possible to refer to something without representational content (like the bare demonstrative, ‘that’, or a proper name), the term “ineffability” is ambiguous between in inability to represent and the inability to refer. It does not follow from our inability to represent something that we are unable to refer to it — we can use a bare name for it without predicating something of it, or describing it in a way that could be true or false. Thus, no, the fact that we can give a name to something does not thereby represent it. (On the other hand, if we can conceptualize it, then it is effable). I’d also suggest we not speak of something “becoming” an effable fact. If it is currently being represented, then it was always representable — always effable. We experience reality as flashes of cognition and so think of time as the point of the present moving from past to future events. Physics codifies this as measures of duration. Yet obviously time is an effect of change, by which future possibilities condense into current actualities and fade to residue. To wit, tomorrow becomes yesterday because the earth turns. As such, time is an effect, like temperature, color, pressure, etc. All of which are equally deeply foundational to our perceptions of reality. While it can be difficult to get the mind around, given thought is a consequence of the narrative effect of the process of perception, it is quite evident only the present state exists, in which energy is “conserved,” i.e. transforms from one configuration to the next. Such that energy is always and only present, while it is the forms which come and go, coalesce and dissolve. Duration is the state of the present, as events pass. So it is both effable and ineffable, depending on one’s objectivity.